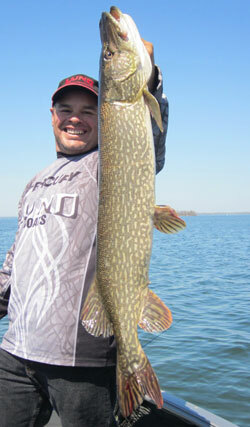 Top pike fishing guides in Montreal recommended by Freshwater Phil. Vast numbers of small to mid sized Northern pike swim in the lakes and rivers surrounding Montreal. 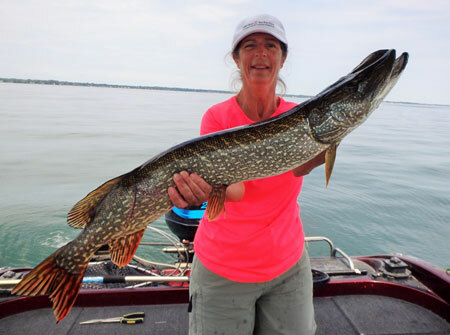 Though these pike are rarely targeted in the Montreal region, they are often caught while casting for bass, trolling for walleye, and occasionally while targeting muskies. What they lack in size in this region, they make up for in ferocity and numbers, and kids just love catching these toothy critters. 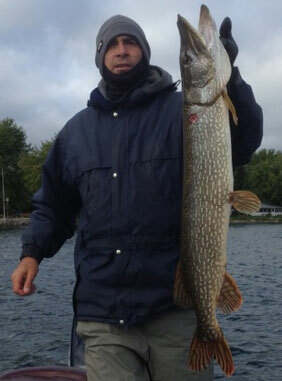 Pike fishing guides will take you fishing for Northen pike, techniques include trolling with spoons or crankbaits, or casting lures line spinnerbaits, spoons, and stick baits. Pike fishing season opens early in May in the Montreal region, guided outings are available all the way through the open water season until winter, and then again thoughout the winter on ice. Boat specs: 19ft Lund, 150HP Verado /15 hp kicker, GPS/sonar. Techniques: Trolling, casting. Available time: May through October. All gear and tackle provided. 3 people maximum. Daily rate: $400, tips welcome. Best time: May thru November.